Shot and Edited By: Andy Tran (syndromeracing.com, dropnzone.com, dumondetech.com, nuun.com). Music By Spekulation "Home feat Picoso"(spekulationmusic.com). Shot at Colonnade bike park at the 2009 Transition Bikes Demo Day. sick! I saw kyle tearing it up through the rocks, and harrison shredding with the best of them. nice man. wow that place looks like so much fun, I WANNA GO SO BAD! CHEA!! Nice to see Groves and Mendel in the spotlight again. suprised I didnt see any 3's in there. Good vid nonetheless. Rain wont stop them from riding there! Wheres this bike park at? just gotta say, the shots at 00:47 and 1:51 have such epic lighting, so beaut. awesome video Andy!!! too bad i couldn't stay longer tho... this has my vote for VOD!!!! Great meeting you at Colonnade on Saturday!! Here are some photos of Transition Demo day! the rainbow bridge looks dusty... awesome vid. i'm angry at myself for having to leave so early. i missed all the action! I noticed the gold helmet right off the bat and was wondering if it was you. Confirmed..lol.. nice. This is the DREAM of every mtb rider. its a place where u can ride during almost every weather! I say: Video of the Day! where is this place? i really want to go! Siiick Video! That was a fun day! Wow, a VOD with no negative propped comments. Must be a winner. im liking the new font!! Nice vid mon! I'm liking the new font too. yet again andy makes a quality video, and puts it on the internet fairly quick. Way to keep'em comin. DEFINATLEY worth VOD!!!! One of the best, if not thee best Colonnade video. Ben Glassen is so sick, watch out for this guy! how cool is that when you can get the actual owners/crew of the company ride with you while you demo their bikes? Dang I was gonna go but ran out of time. Looked like there was some sweet stuff pulled off! Where is this bike park at? 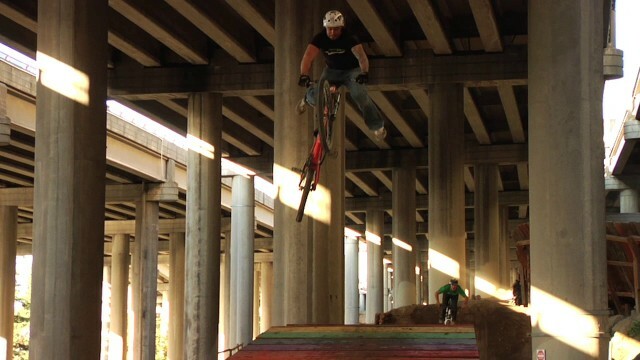 its fun, nothing too special, under a freeway if you didnt know. the best thing is that its dry all year round, and it makes for good winter riding. So sick! loving transition at the moment! how can I made my video best video of day??? holy sh*t Lars! 2:08 is SICK!!!!! i love this place it is very fun to ride . Sick Vid! That was a super fun day forsure! Totally agree the music doesnt fit with the video!! Who is it?? Orishas?? I was there too. Super rad. I totally got edited out. is this uner and under pass or something? This is sucha sick place to ride! Deserves to be VOD! congrats on another awesome VOD man!!! oh not it didnt... it deserved VOD. good vid, but the music is horrible. sounds like that f ag daddy yankee.